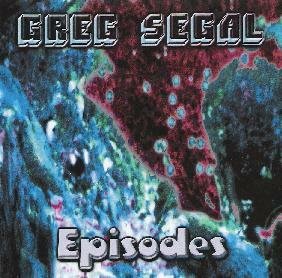 Greg Segal had set out to release a CD for each month of 2004, and while circumstances have caused delays in his schedule, he's still cranked out an impressive number of interesting and varied sets of music this year. Episodes is the latest, and consists of four short tracks and the 30 minute title track. The set opens with "The Floodwaters Of Memory", a fiery bit of instrumental prog rock with a slight Captain Beefheart flavor. I was disappointed that this ended at less than two minutes. Lots of possibilities to develop this one. "Darkland College Library" is a cool bit of Bluesy heavy rock that also strays into prog rock territory. "Wrongs Of Passage" is yet another hard rocking prog rock instrumental with too much promise to end so soon. And "The Museum At 20,000 Fathoms" goes in a completely different direction, being a bubbling, droning, aquatic sound art piece. But it's the lengthy title track that dominates the album. "Episodes" opens with multi-layered avant-bluesy-rockin' guitars. Greg jams away briefly in hard prog-psych land, before transitioning into a chaotic mish-mash of oriental flutes, volcanic space electronics, drones and voice samples. But the chaos quickly subsides and a more defined theme kicks in... though it's evolving, or better yet, mutating, at a rapid pace. We‘ve got orchestral elements, sound textures and general sound experimentalism, plenty of atmospherics, mostly on the darker side of the mood spectrum, rock and psych guitar, along with the usual array of Segal guitar sounds and manipulations, and an assortment of avant-prog bits and pieces. I could give a play by play of the whole 30 minutes but reading it would sound so manically all over the place that you really have to give it an attentive headphones listen to appreciate it. There are seemingly countless pieces, or episodes, that would make the basis for larger works of their own. There's lots of spaced out stuff, proggy trippy rockin' stuff, oddball sound gloms and interplay, interesting incorporation of samples and field recordings, and freakiness abounds throughout. One of my favorite parts is the segment leading up to the end where Greg has a weird space rockin' thing going on, that then shifts to a freaked out, and still spaced out, avant Blues-rock bit that jams on to the end. I really dig it and after probably 3 or 4 close listens now discover new little goodies with each subsequent listen. Settle in for the ride and you'll hear what I mean. Contact via snail mail c/o Phantom Airship Records; PO Box 82525; Portland, OR 97282-0525.